The Twilight Zone ran from 1959 to 1964 for 156 episodes and remains an enduring icon in American television history. 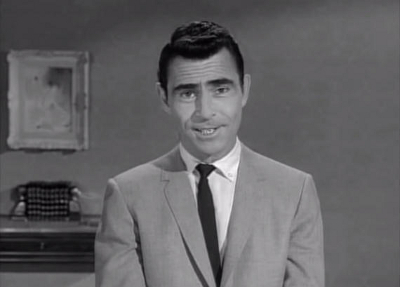 It was created by Rod Serling - who also wrote many of the episodes and appeared near the start to present an introduction monologue to camera ("Submitted for your perusal...") and then ended each episode with a closing piece of narration in his distinctive manner and voice. The series was alternately spine chilling and touching as each week a variety of characters took a wrong turn into the Twilight Zone, a place where anything could and often did happen. Serling was born in New York in 1924 and had a fairly extraordinary life until his premature death in 1975 from heart problems at the age of 50. Although a famously diminutive man he was a paratrooper in World War 2 and fought in New Guinea before taking part in the invasion of the Philippines (suffering bad shrapnel wounds to a leg in the process). After the war he enrolled in Antioch College in Yellow Springs where the environment was a lasting influence on him and the motto was 'Be ashamed to die until you have won some victory for humanity' - a line which Serling later incorporated into a touching Twilight Zone episode called The Changing of the Guard with Donald Pleasance. While working nights for a radio station after graduation, Serling furiously wrote during the day over his kitchen table and eventually broke into television where he won acclaim for his dramas Requiem for a Heavyweight and Patterns. He was hailed as the new Arthur Miller but Serling was frustrated by the conservative nature of American television and felt constricted in his ability to address social issues like injustice and racism. He discovered though that it was perfectly possible to get scripts with controversial or political subtexts past the censors if one disguised them in a science fiction or fantasy setting. So was born The Twilight Zone, one of the most famous and influential programmes in television history. Serling wrote 99 out of the 156 episodes of The Twilight Zone and although he was always insecure about his own achievements it's safe to say they were considerable and timeless. In addition to Serling, the series had many episodes written by talented people like Charles Beaumont, Richard Matheson and Earl Hamner Jr and a host of actors who would become familiar names were on the show. Robert Redford, Burt Reynolds, William Shatner, Charles Bronson, Elizabeth Montgomery and so on. The series had a sort of regular company of actors who would frequently appear in different episodes. Perhaps the two most cherished Twilight Zone stalwarts were Burgess Meredith and Jack Klugman. You know it's going to be a good episode if Jack Klugman is in it. We are going to look at two episodes featuring Bond alumni though - if you can call Barry Nelson that. Well, he was the first actor to play James Bond in 1954 in that Casino Royale curio. 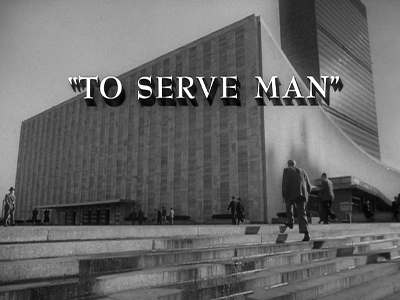 To Serve Man was directed by Richard L Bare and written by Rod Serling. This is episode 24 of the third series of The Twilight Zone and was first broadcast in 1962. To Serve Man is one of the most famous Twilight Zone episodes and was based on a story by Damon Knight. US government cryptographer Michael Chambers (Lloyd Bochner) tells the extraordinary story of how he came to be aboard an extraterrestrial spaceship - apparently being held against his will but in relative comfort. "This is the way nightmares begin... or, perhaps, end. Very simple, direct, unadorned. Incredible, and yet so terribly real that even while they're happening we live with them, attest them, and assimilate them. And if it's 12 o'clock noon, that's what you preoccupy yourself with. You don't think about 12 o'clock noon on the next day or the day after that. But that's what we should have been thinking about - tomorrow and the day after tomorrow. We were preoccupied with hands on a clock... when we should have been checking off a calendar..."
It all began when The Kanamits, a race of nine-foot tall aliens, arrived on Earth offering friendship and peace. The governments of Earth are rather suspicious at first but Kanamit ambassadors visit the UN and pledge to share their technology to make the world a better place. These alien visitors quickly make good on their promises, transforming deserts into fertile fields, ending hunger and supplying cheap and safe energy. They even set up an exchange programme so people from Earth can visit their home planet - which they promise is a paradise. A book left at the UN by the aliens is taken by US government cryptographers and the title is eventually translated as 'To Serve Man'. It seems benevolent enough but as they beaver away at translating the rest of the book a secret is waiting to be revealed. To Serve Man justifiably stands as one of the most memorable Twilight Zone stories mainly because of its wonderful shock ending - definitely one of the best twists in the series. One thing I love is the team of US government cryptographers who work at translating the book left by the aliens at the UN. It gives the story here a wonderfully old-fashioned air of science doing its level best to get to grips with something quite beyond anything it ever expected to encounter - an alien language. It's quite amusing in the United Nations scenes the way that the French seemed to be the most obstinate in not trusting the aliens. They always have to be different. I like the way the story here here lulls you into a slightly false sense of security but always keeps you aware that there are secrets waiting to be uncovered. Lloyd Bochner is suave as the solid lead but it's Richard Kiel who really steals the show as the Kanamit ambassador with a huge domed head prosthetic and flowing robes. He is downright weird looking with spaced out eyes and that unmistakable physical presence. His scenes at the UN are very striking because he looks so out of place. Kiel plays all of the Kanamits you see in the episode and this tactic works quite well, giving them a creepy uniformity. At the time Kiel was shooting a famously bad (Mystery Science Theater 3000 lampooned) film called Eegah where he played a caveman. He was allowed to take a week off from the caveman shenanigans to shoot To Serve Man. 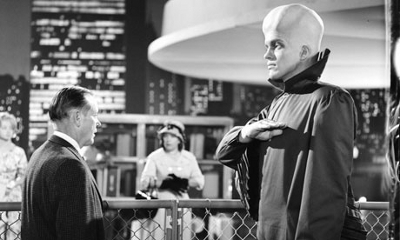 To Serve Man has a great atmosphere with the black and white and stunning music cues from Jerry Goldsmith. I believe the alien saucer section in the episode is from Forbidden Planet and some stock footage from The Day the Earth Stood Still was used to depict the Kanamits arriving. The classic fifties sci-fi trappings are fun. Serling apparently insisted on reshoots after being unhappy with the initial cut and also inserted the flashback structure at a later date. His revisions obviously worked as this is considered to be a classic now. It all builds to the most oft-quoted line in Twilight Zone history and a darkly amusing coda by Rod Serling. To Serve Man is fantastic. Stopover in a Quiet Town is episode 30 of the the fifth and final season of The Twilight Zone and was first broadcast in 1964. It was written by Earl Hamner Jr (of later Waltons fame) and directed by Ron Winston. 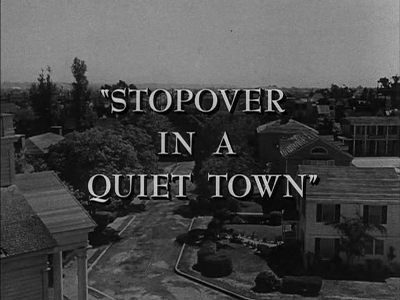 Although Hamner was one of the more whimsical writers on the show, Stopover in a Quiet Town is one of the creepiest of the later Twilight Zone episodes. The story has a well heeled New York couple - Bob (Barry Nelson) and Millie (Nancy Malone) Frazier - groggily waking up in a strange house after a night of heavy drinking. They have no idea where they are or what exactly happened the previous evening, only that they remember a huge shadow appearing over their car at one point but their memories are fogged. They find the house they've woken up in is completely empty. Even stranger is the discovery that the house is filled with fake props like a television studio set. The cupboards are just glued on and the fridge is full of plastic replica food. The bewildered couple wander outside and find themselves in a small town that seems to be completely deserted. Where is everybody? Why does the grass seem to be made of papier-mâché? And why do they keep hearing a little girl laughing in the distance? What the story does very nicely here is set up a strange and intriguing mystery that slowly unravels as the characters get closer and closer to the shocking secret of the town. 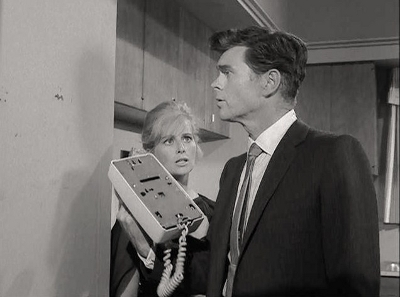 The twist is enjoyably far out (but very Twilight Zone) and it was borrowed in fairly shameless fashion for a great episode of Hammer House of Mystery and Suspense many years later. The couple in the story are streetwise New Yorkers who have just had far too much to drink during a raucous night out and are most concerned now with the fact that they going to be late for work. Problems soon arise though because they've got no idea where they are and they can't find a single solitary soul anywhere. Knocks on doors are met with silence and even when they presume everyone must in the town church for some sort of service they find that completely empty too. "Give me the big city any day!" says Bob. "At least then you know you're being stared at!" This is one of those Twilight Zones stories that uses isolation and a gradual sense of panic to create a very atmospheric and strange story. The fact that the couple are quite ordinary and gently bickering with throbbing hangovers makes them easy to relate to and imagine what it might be like to be their predicament. There are some elements of that David Fincher film The Game here when they find out that the house they are in is full of fake props and the story really becomes gripping when they find that any attempts to leave the town always appear to be doomed. The cars in the street don't have any engines and when they - with great initial relief - find a train station and hop on a waiting train, it only takes them around in a complete circle back to where they started. The sense of atmosphere in Stopover in a Quiet Town comes from the fact that the town is eerily empty and abandoned with only a sense of stillness and quiet apparent. The spooky thing is that the town seems normal on the surface with no sign or panic or flight, it's just empty. Isolation was often used to good effect in the series (Where is Everybody?, The Lonely) and Stopover in a Quiet Town is another example of this recurring theme. The two leads do a perfectly decent job here in their respective roles as their bicker, trade quips, and generally try to work out what is going on. You believe in them as a couple and Nelson and Nancy Malone have good chemistry togther. It isn't regarded to be a classic and some might roll their eyes at the twist but I had a lot of fun with Stopover in a Quiet Town. If you ever plan a Twilight Zone retrospective I'd happily recommended both this and To Serve Man as candidates.